….. A reading of the Creation story in Genesis reveals that it was not intended by the Creator that we humans should have it all. There was – in the middle of the garden – a tree of forbidden fruit, a reminder, both then and now, that the persistent cravings of the individual and the collective desires of societies are never going to be fulfilled for we are not gods but a people in need of God’s grace. Like Adam and Eve, we judge the Creator’s work “not good enough” and if God’s inadequate work is going to get fixed, we think WE have to do something. But at the heart of Christianity is the confession that we are completely at the mercy of God to receive life and meaning. Neither the products of the world nor the promises of the Christian life will ever make us into something other than what God has made us to be. ….. There are magnificent stories of healing and feeding in the Bible – offered as part of Jesus’ ministry of reconciliation to draw the broken to God. What God wants, more than anything, is to love us. If we understood the value of that, it would always be enough. But that doesn’t satisfy us. We would prefer that he fix us. ….. The Biblical Christmas message is that the Holy Spirit of God has conceived something in our lives that we hadn’t planned. Being devout Jews, Mary and Joseph knew God was up to something that would bring hope. Most of the time, that is about as clear as it gets for us too, but as long as we believe God is up to something, we have hope despite our distress. The church should be seen as a family of grace based on human need and limitation – diverse, compromised and broken – as a fellowship living in the world where we come together to discover that very hope. This book deals candidly with questions and mysteries common to most of us on the subject of prayer – is God listening? why does God not intervene when the world seems to be falling apart? what good will my prayer do against terrorism or hurricanes? if God knows everything, what’s the point of prayer? why do answers to prayer seem so fickle and capricious? does a person with many praying friends stand a better chance of physical healing than another equally deserving one with only a few people praying for her – is it ” a pyramid scheme or mathematical formula in which God calculates the total amount of prayer-pressure being applied?” does prayer change God or change me? how do we reconcile the changeless God we meet in the Bible with the responsive God we also read about in the Bible and encounter in prayer? We cannot know the answers to these queries but even wrestling with these subjects as Yancey does in this book sheds light and provokes thought. The author deals as well with the process of prayer – the grammar and fluency of prayer, suggesting a study of the Psalms, the Lord’s Prayer and Paul’s prayers as a helpful training ground. He emphasizes the need for discipline and persistence in the practice of prayer and deals at length with different kinds of prayer – supplication, thanksgiving, unanswered, confessional,for healing, prayer for others, prayer for ourselves, meditation. A thorough study of the complete Bible is a time-consuming activity as well as one that challenges our true understanding. THE STORY is written for those not wishing to read the whole of the Bible but portions of the Bible offered in storybook – or novelistic – format. Such a presentation of sacred Scripture is a formidable task. THE STORY is divided into 31 chapters. Each of these contain some excerpted passages of Scripture drawn from the New International Version of the Bible and placed in chronological order. In an attempt to make the Biblical narrative flow like a novel, transitions written by the editors are inserted to summarize omitted Scriptural text in the storyline. A chart at the back of the book informs readers what portions of Biblical text are included. In addition, there is a timeline of events in THE STORY and a section of thought-provoking discussion questions on each chapter as well as a brief introduction to the characters encountered in THE STORY and a chart of references. So, clearly THE STORY is intended as a condensed, readable version of the Bible for one who wishes to see the threads tying together the Old and New Testaments into a continuum of God’s love. The reader must, however, be willing to accept, in this truncated version of the Bible, the omission by the editors of large parts of the Bible such as parts or the whole of Psalms, Proverbs, Job, Ecclesiastes, Song of Solomon. The editors’ passages of transition from one Scriptural text to another are sometimes laced with colloquialisms which tend to jar when juxtaposed next to Biblical text. But the concept of this book is valid and THE STORY might prove of value to one who wants an easily understood “big picture” of the Bible. It brings Bible stories to life in a new and interesting way and reveals that humankind in a different time and place is nevertheless much like us today. Most definitely, I was – and am there today! Studying the tableau of those who played a part in the Passion story of Jesus, I see myself in the PERSON of PETER, the riddle of his early recognition of this simple Nazarene as the Son of God, yet subsequent impulsive denial, recurrent neglect and lack of faith. No – I’m not Peter – I see myself in the PERSON of JUDAS, Jesus’ good friend, deserving of the scorn for one who betrays a friendship, then refuses to accept the proffered forgiveness and love of the one betrayed. Then, there is that government bureaucrat appointed by Rome – the PERSON of PILATE, a coward who used his power to exercise zealous retention of his own reign and to satisfy his own desires. Wait a minute!! Is that MY OWN FACE I see in that mob of people shouting before Pilate to do away with this modest man whom the crowd considers a threat? Lacking the courage to be the dissident willing to live out my faith and beliefs and accept the consequences, I hide behind this mob and rationalize – “THEY called for his crucifixion”. Even during his waning hours on the cross, Jesus focused his attention on his mother expressing his concern for the beloved MARY who, as the chosen instrument of God, had borne, nurtured and raised him to fulfill his mission as the Son of God. An active participant in the dramatic scene of long ago, the Gentile CENTURION who, while following his orders in Jesus’ execution, became a believer – we know not what subsequently became of this character in the Passion Play – did his conversion “stick” as a way of life? We can speculate about the WOMEN who viewed this drama on Golgotha from afar – a distant position familiar to women in a patriarchial society of first-century Palestine where men shared center stage. These women looking on with utter devotion, pain and resignation – and it was they who came to the tomb on the third day to anoint the crucified one – and found the tomb empty! Let’s be honest – I see my visage most clearly in the PERSON of DOUBTING THOMAS who failed to recognize his resurrected Lord and demanded proof from this one who had been the center of his devotion and life experience. Doubt is compatible with religion and our faith grows as we too “live the questions”, lacking the proof demanded by Thomas. WERE YOU THERE? is the author’s impression of how it may have been for the character/participants in this most powerful drama of the long ago and how our lives – even today – parallel the lives of those who were players. Find this interesting read in the church library and exercise your imagination….. 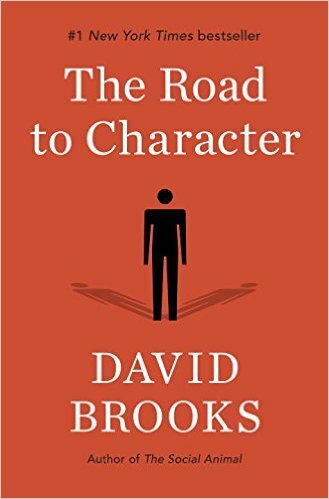 In our current culture of the “Selfie” – the Big Me – this work by David Brooks, the New York Times columnist and best-selling author, focuses on values that shape our core personality. Is our self today being shaped primarily by “resume virtues” that lead to wealth, career achievement and status, or by “eulogy” virtues – deeper core characteristics, such as humility, honesty, kindness and faithfulness, connected to inner worth? Though not intended as a religious book, Brooks states flatly that we are, indeed, sinful, flawed creatures struggling with ourselves and “straining on the rack of conscience”. He says – “We are all saved by grace” – a theological term meaning a rescue from the outside which comes as a byproduct of our striving to build a rich inner life marked by self-discipline and moral depth. In The Road to Character, the reader is introduced to mini biographies of historical individuals who achieved a meaningful life and strong moral fiber having struggled against their own weaknesses – individuals as diverse as Frances Perkins, Dorothy Day, A. Philip Randolph, George C. Marshall, Samuel Johnson, Bayard Rustin, Saint Augustine, George Eliot, Dwight Eisenhower, Johnny Unitas, and Joe Namath. Through the inspirational example of these people, Brooks hopes to bring his readers back to sacrifice and self-restraint in our materialistic world. He offers his social studies research in an accessible way and shows that by cultivating a “eulogy virtues'” ecology we can create strength of character and balance in our lives. Pastor Sean told us a little about Henri Nouwen in his sermon on February 14 (click here to listen to Feb 14 sermon) and about a book that he considered a favorite. We have that book (In the Name of Jesus) and others written by Nouwen. Reaching Out: The Three Movements of Spiritual Life. Each book is fairly short and is a gem. I recommend them for your Lenten Reading. They can be found on the book cart in the Library. A Faithful Farewell, is a remarkable channeling of the voice of one who is dying – a gem of fifty-two reflections on the thoughts and experiences of one crossing the threshold from this life to the next. The author, for many years a Hospice volunteer and professor of medical humanities, chose this style of writing – in the first person – to lend her work a forthrightness and intimacy that makes this book both poignant and compelling and a valuable aid to those experiencing the slow and often lonesome process of dying and to any who minister to them. Each meditation is succinct and to the point, a thought worth pondering – one of hope and comfort. Chapters on fear, pain, boredom, regret, anger, losing control, loss of privacy, family conflict, sadness and gratitude include a brief related Biblical reference, prayer and perhaps a quote from a favorite hymn. McEntyre deals in a perceiving – almost person-to-person – way with the dimensions of dying, offering at the same time the assurance of God’s grace and reassurance that He goes to prepare a place for us during the closure of life. It is a beautiful as well as helpful read! In The Emmaus Code, author/lawyer David Limbaugh posits that the heralding of God’s plan for salvation, with Jesus Christ as the centerpiece, is woven throughout the Old and New Testaments. He points to verses and passages in all thirty-nine books of the Old Testament that suggest the coming of Jesus Christ. And further, Limbaugh suggests that our study of the mysteries and hidden truths in the Old Testament is enlightened through a look at the later encounter between Jesus and two travelers on the road to Emmaus who failed to recognize the presence of the risen Christ. It was at this time Jesus chose to reveal His identity to them, the significance of His ministry and how their Bible, the Old Testament, had pointed to Him all along. The first half of The Emmaus Code is an overview of Old Testament history, covenants and prophecies. It is in the second half that the author details, through numerous references to Old Testament passages, an impressive amount of foreshadowing long before Jesus’ birth. Because The Emmaus Code is replete with these juxtaposed scriptural references, it is not an easy read but useful to one seeking the connecting thread of the Old and New Testaments. In the Appendix, there is a side-by-side chart of the Messianic Prophecies of the Old Testament – the Prophecy, the Old Testament reference and the New Testament Fulfillment. It may be that at times a reader will question if a certain Old Testament passage is actually a reference to Jesus but Limbaugh’s premise that Jesus Christ is the unifying force of the Old and New Testaments is well demonstrated and an aid to our understanding.